Tom Herman added two Houston-area running backs in his first Texas class when Toneil Carter and Daniel Young signed in 2017. Texas signed the best in-state running back in the 2018 class when Carthage running back Keaontay Ingram chose the Longhorns on national signing day. Add juniors Kyle Porter and Kirk Johnson and Texas can afford to be picky in 2019. Five scholarship running backs will be on campus by the time the 2019 class reaches campus, though two will be seniors. Ideally, Texas would like to add two running backs in the 2019 class. Texas is already recruiting at the position for 2020. Galena Park North Shore sophomore Zachary Evans might be the best running back in the country in the 2020 cycle and he’s a top priority for the Longhorns. Ingram and Evans have star potential, and it’s up to the Texas staff to find a gem or two in the 2019 cycle to provide depth and production. Texas’ leading returning rusher from the 2017 season is quarterback Sam Ehlinger. The ideal running back cycle for Texas would include signing Cain and Glass. Cain, a Texas native, is close with UT running backs coach Stan Drayton. Returning home could be something Texas tries to push when recruiting Cain, but IMG Academy also teaches prospects how to live away from home and makes location less of a factor. Cain is a former Denton Ryan star and the No. 1 target on Texas’ running backs list. 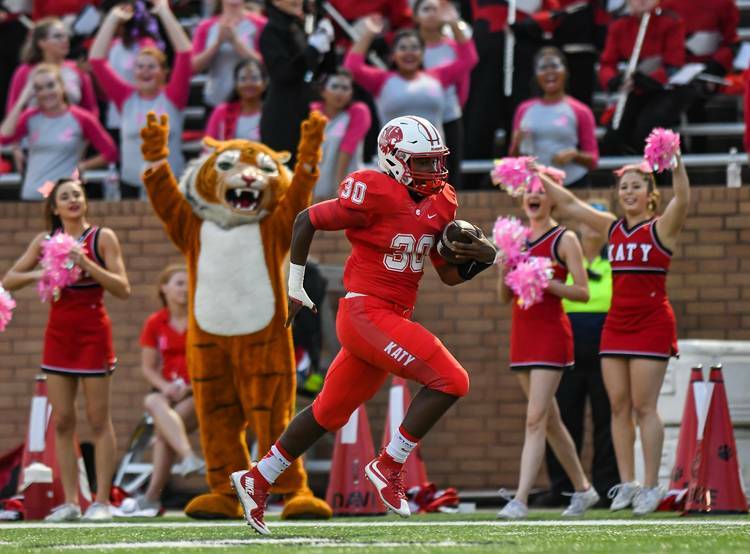 Glass is a 4-star from Katy, the same school that produced Porter and 2018 defensive tackle signee Moro Ojomo. That pipeline will help the Longhorns lure Glass, a prospect who plays his recruitment close to his vest. Glass visited Texas for junior day and mentioned reuniting with his former teammates in Austin. Texas would take Glass and Cain. It’s also possible the Longhorns would focus on other positions if Glass or Cain committed, taking just one running back for the second consecutive cycle knowing they’re in good position for Evans in 2020. Texas is in position to land the best running back in the state for the second consecutive cycle if the Longhorns land Glass. Adding Cain would give Texas one of the top running back duos in the 2019 cycle. Cain will be tougher to recruit because his high school is in Florida and every top program in the country views him as a priority. Glass appears to be the most viable option currently holding an offer. He’s the only in-state prospect at the position with a Texas offer, meaning he’s the top priority in Texas for Herman and his staff. Texas won’t have as many scholarships to use in 2019 and Glass could be the only running back signed if he pledges to the Longhorns.